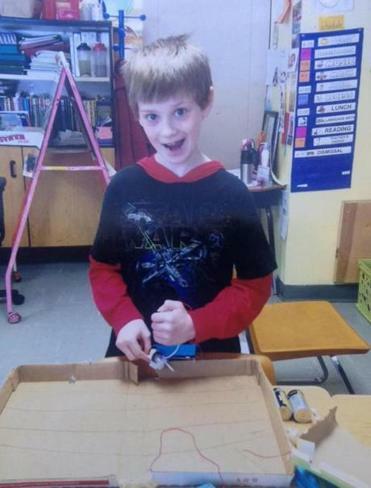 Fifth-grader Nickolas Taylor was suspended from school. MILFORD — On Friday, Milford fifth-grader Nickolas Taylor was in line for lunch, with the weekend just around the corner. But like a lot of 10-year-old boys bursting with energy, he didn’t wait quietly. Instead, he played a game of shoot-em-up to pass the time, pointing his index finger like a ray gun and making “pew-pew” shooting noises, according to Nickolas’s father, Brian Taylor. As he battled his imaginary foes, he jumped in front of two girls in the lunch line. They told the assistant principal, who suspended the boy for two days for making a threat. Nickolas didn’t mind all that much, but his father did. He aired his grievances to The Milford Daily News, fueling the debate about whether schools have gone too far in cracking down on toy guns — even imaginary ones. Taylor said he understood that schools are on heightened alert these days to any perceived threats or potential bullying, but criticized the suspension as an overreaction. Taylor, 40, said he met with the assistant principal Monday to explain that the incident was just “innocent playing.” But he said the principal told him Nickolas had pretended to shoot directly at the girls, which amounted to a threat. In a “conduct referral” form the school gave to Taylor, school officials wrote that “the young ladies informed Nick he was not allowed to cut the line. “At that time Nick acted out, shooting the two girls with a gun made from his hand. He then blew on his fingers as if to cool off the gun barrel,” it said. The superintendent of schools, Robert Tremblay, and the Stacy Middle School principal, Nancy Angelini, had a “productive meeting” with Taylor on Wednesday that resolved the matter, according to the statement. He also defended the suspension of Nickolas. But the chairman of the town’s school board, Scott Harrison, criticized the penalty. “If this was an issue where we believe that the child could possibly cause some harm, I don’t know how sending him home resolves the issue or gets this child the help that he needs,” Harrison said. William D. Buckley, a member of the Board of Selectmen, was also critical of the suspension. Taylor said Nickolas loves video games and told him all the boys play pretend shooting games at recess and shout laser-like sounds. Nickolas has attention-deficit disorder, which can affect his schoolwork, his father said. But he is a solid student and generally enjoys school.